The year just ending had seen the initiative pass to the Allies, both in Europe and in the Pacific. Japanese admiral, Yamamoto (killed when his plane was shot down) had foreseen it. But Hitler and the rest of the fanatical Nazi leadership still lived in a dream world. The Allied victories in North Africa and Sicily had caused Italy to change sides and join the Allies. America’s phenomenal industrial might was providing masses of aircraft and armaments to Britain, China and the Soviet Union. A second front in northern France would become a reality within the next six months. Russian factories beyond the Urals were producing war materials at a furious rate and Soviet armies had driven the Wehrmacht back to the Polish border. In the Pacific, the Japanese continued to lose territory as a result of America’s ‘island-hopping’ strategy, while the Australian and US forces had also been victorious in New Guinea. The Chinese were also enjoying the fruits of victory. Although still over a year and a half away, the end of the war was in sight and could not come too soon for the millions fighting, or suffering the hardships and privations of the home front, or enduring life in any one of the thousands of prison camps. The sketch upper left is dated 1 January 1944—New Year’s Day—and was drawn by Ronald Searle. So was the picture to the right. Searle had trained as an artist before the war. After joining the Royal Engineers, he was shipped to the Far East and then captured by the Japanese after the fall of Singapore. 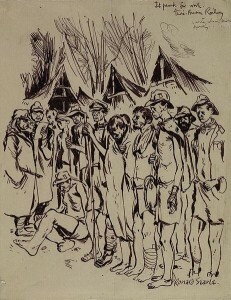 He survived the war and became well known for the drawings he had done during his years of captivity. After the war, his fame continued through his well-loved cartoons of cats, schoolgirls (The Belles of St. Trinian’s), and other aspects of British life. 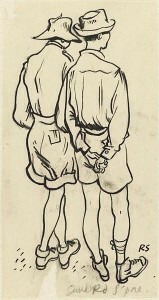 This entry was posted in World War II and tagged New Year, POW, Ronald Searle. Bookmark the permalink.